→ megamap error how to fixed ? megamap error how to fixed ? Re: megamap error how to fixed ? megamap tends to be very buggy I would recommend switching to GoldMap or JohtoMap. Maybe is a error with the VisualBasic libraries, try to install the Microsoft ActiveX Control Pad. Megamap works better on 64-Bit Windows. I have it and it works. Megamap let's you use the extended tiles correctly, but megamap/zeromap do not have a built-in tileset editor. You will need to use the standalone tileset editor (often called "Melash's Tileset Editor" or just "Tileset Editor") and you will need to increase the DPI settings in Windows. This will make everything be scaled up and allow you to see the rest of the tileset in the viewing area so that you can use the extra tiles to make your map blocks. There should still be a tutorial on that somewhere around here. megamap/zeromap do not have a built-in tileset editor. Well, that part is not true for the latest version. 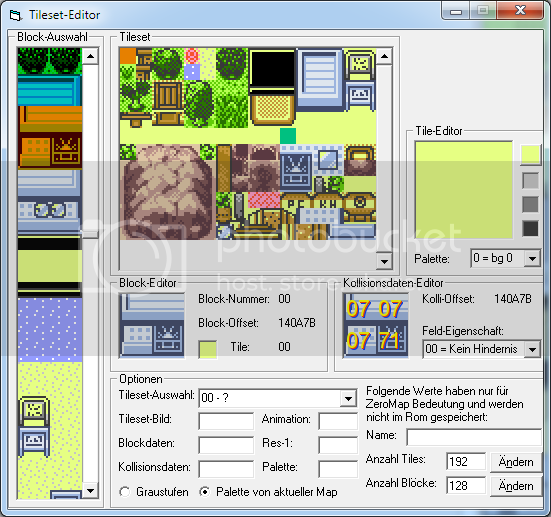 I know that Megamap does not have a built-in tileset editor, since it is just a cheap hack of ZeroMap. I was not aware that newer version had a tileset editor, but it looks like a really nice one. And I don't really know why people call it "Melash's Tileset Editor" because I know he didn't make it. I guess it was because he posted the english version here IIRC.